Financial responsibility ensures that the majority of funding is spent on instruction. 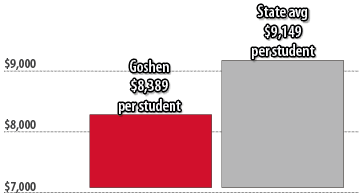 Goshen Local Schools produces excellent results at below average costs. The average cost per pupil is significantly lower than the state average. GLSD cost per pupil for FY 2017 is $ $8,389 while the state of Ohio average is $9,149. In Ohio, the funding of schools is shared by the state and local school districts. The Ohio General Assembly determines the cost of an adequate education. The chart below, which represents Goshen’s FY2017 funding sources, demonstrates the low burden on our local taxpayers. Approximately 1% of tax revenue comes from commercial/industrial means. Due to strong, proactive planning and operating inside our means, GLSD has not received an increase in property tax dollars by the means of an operating levy since 1976, in large part because taxpayers approved a 1% income tax issue in 1989. In 1999 the district was fortunate to couple with the State of Ohio on a 80% - 20% construction project that cost taxpayers $6,891,000 and the state paid $26,352,360. These approved bond dollars allowed us to build a new high school, renovate Spaulding Elementary School, Marr/Cook and Goshen Middle School. Due to timely refinancing and wise financial decisions, this debt issue should be paid off early, saving tax payers dollars. This 1999 bond issue is due to be paid off in 2019. Originally this bond issue was structured to be paid down by 2023. However, through wise investments and refinancing the bonds the 2019 early pay off will save the community and taxpayers nearly $1.2 million dollars. 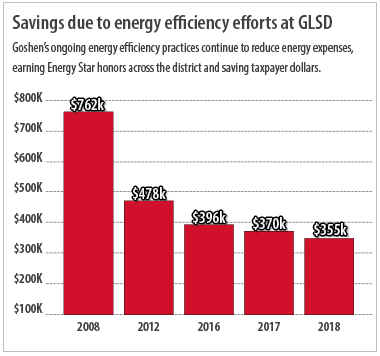 With the addition of energy efficient initiatives funded through low interest loans, Goshen has saved more than $200,000 yearly since 2008. Over the past 8 years the district has saved more than $2.4 million through proactive planning, which include new initiatives and cost saving measures such as LED lighting, installing high efficiency boilers/chillers and electronically controlling our energy use through technology innovations.